Our first United States born Femme Fatale, Scarlett Johansson (USA, November 22, 1984) starred in The Island (2005). From Wiki, “It is described as a pastiche of “escape-from-dystopia” science fiction films of the 1960s and 1970s such as Fahrenheit 451, THX 1138, Parts: The Clonus Horror, and Logan’s Run.” While this is true at the beginning, this is just the lead-in to a series of action sequences mixed into constant running. 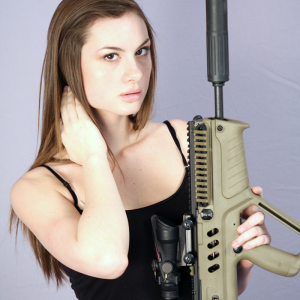 The Internet Movie Firearms Database lists her using only the North American Arms Guardian. The Guardian is made only a few miles from where I type this, admittedly one reason I chose to add Scarlett from this film. In fact we took a tour through their facility just last month (our tour photos were also picked up by a Russian blog).